When I started thinking about what to get you for the holidays, it came to me in a flash: what could be more perfect than a brand new food challenge? 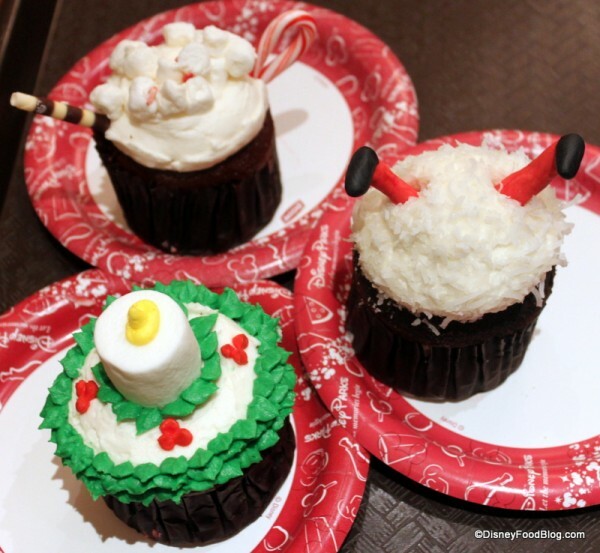 2012 DFB Holiday Cupcake Crawl! Remember, many of these cupcakes can be purchased with a Disney Dining Plan snack credit, so be sure to stock up and save them for this important undertaking! Let’s begin in Epcot, where I’m so excited to share with you a really super fun find from Epcot’s America Pavilion. Within Liberty Inn, you’ll find another life-size gingerbread house, similar in scope to the Grand Floridian’s display. And much like that house, you can purchase goodies here as well! American Adventure Gingerbread House Mini Cupcake Assortment: NEW THIS YEAR is a really fun treat that I couldn’t wait to try! Rather than having one ginormous cake with just one flavor, the pastry chefs at Epcot are offering four different mini-cupcakes served together. 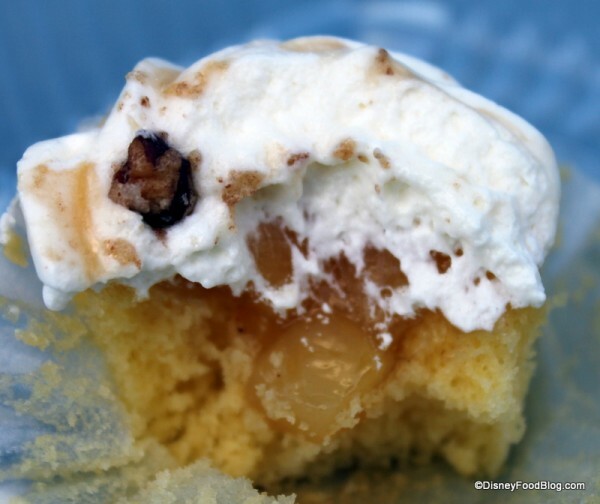 The Apple Pie Cupcake features a lovely surprise inside — apple pie filling! Crowned with fluffy vanilla icing and garnished with a sprinkle of streusel and nuts, this one is a winner. The rich, moist cake of the Egg Nog Cupcake is topped with a lovely vanilla frosting as well, and a heavy garnish of fresh nutmeg. And there really is EGG NOG IN THERE! How do they do it? I have no idea. 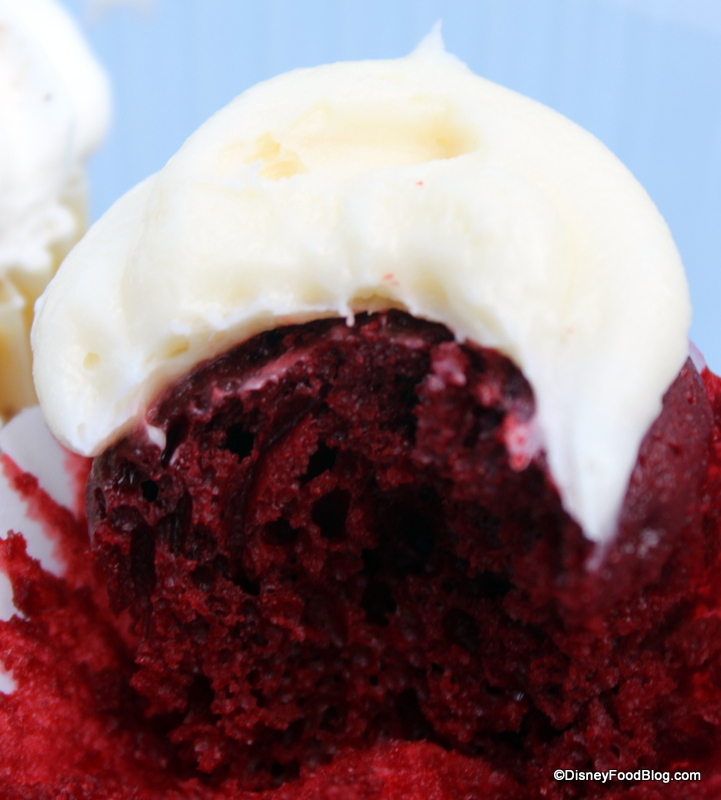 The Red Velvet Mini Cupcake is topped with a generous swirl of cream cheese icing. Favorite. 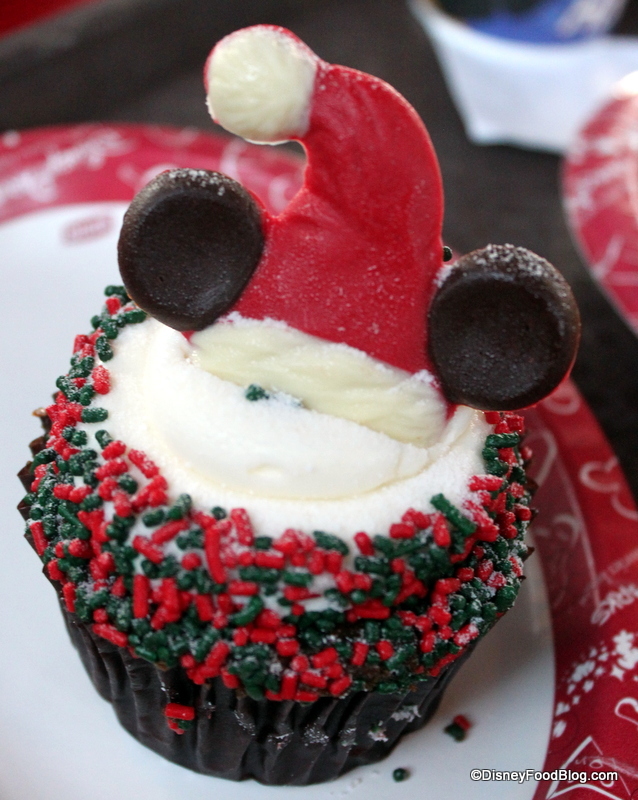 The Mini-Gingerbread Cupcake isn’t as dark or rich in color as its Disney Hollywood Studios counterpart (more about that one in a minute), but the spicy cake and fluffy icing were still a nice treat. There’s plenty of spice throughout the cake as well! 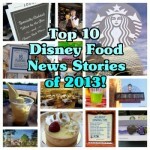 Main Street Bakery in Magic Kingdom is home to a huge assortment of delightful baked goods. The holidays are marked with beautiful and whimsical seasonal treats. Main Street Bakery DAILY Cupcakes: The seasonal cupcakes here come in several versions: chocolate cake with vanilla frosting; red velvet cake with cream cheese frosting or vanilla frosting, vanilla cake with vanilla frosting, and more! These are available all day, every day! Once again, the real star of these cupcakes are the cute designs that top them. Who could possibly resist peppermint swirl buttercream? 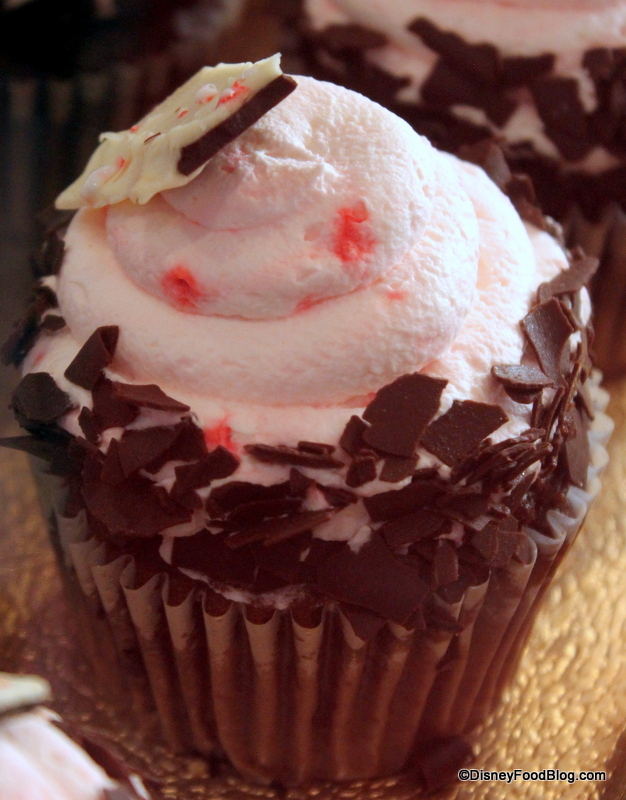 The Santa cupcake is a rich dark chocolate, while the cocoa cupcake is more of a milk chocolate cake! The candle is vanilla on vanilla. Yum! 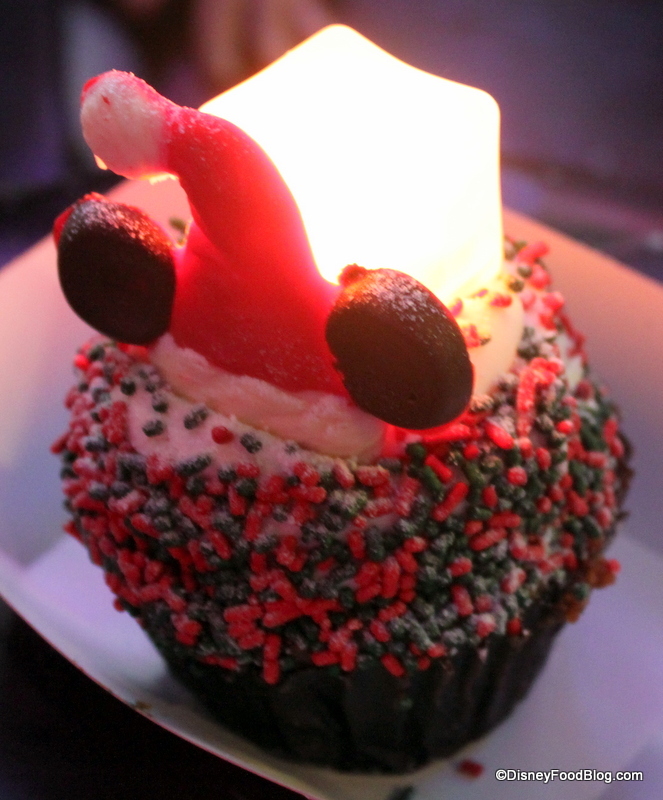 When you’re ready for some more park action, take the bus over to Disney’s Hollywood Studios and sample the most-talked-about holiday cupcake in Disney World! 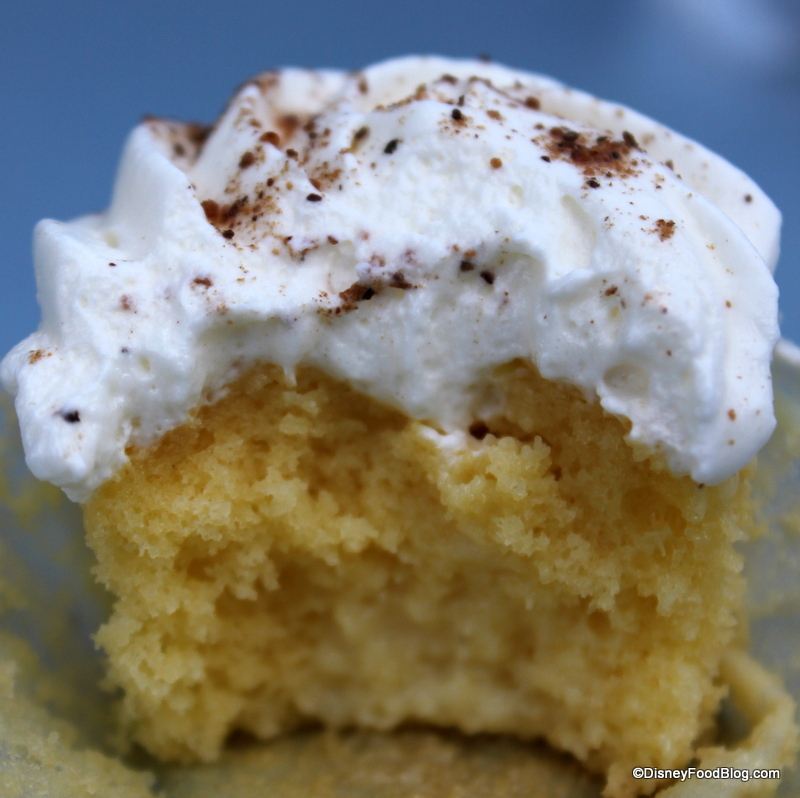 Gingerbread Cupcake: This one caught my eye as soon I heard about it, and I knew that I’d be sharing it with you on my very next visit to Disney World. Dark, moist, spicy (but not TOO spicy!) 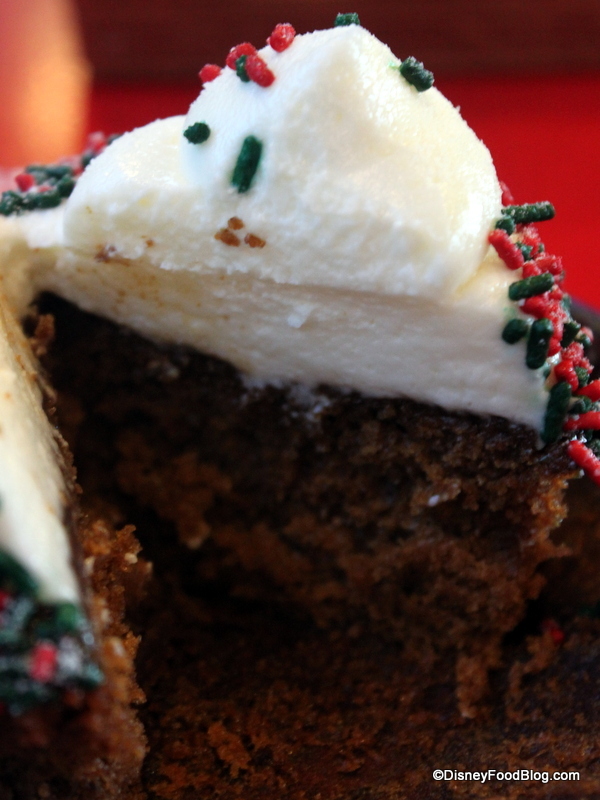 gingerbread cake is topped with cream cheese frosting mounded high on top. 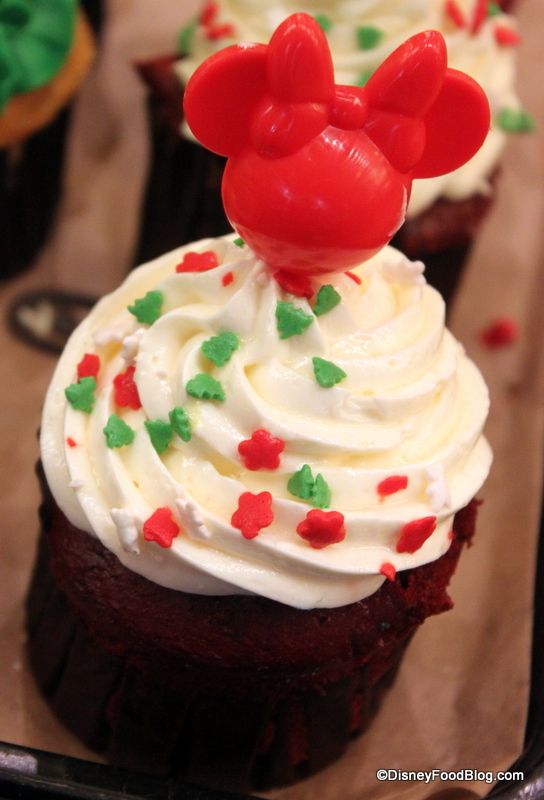 Add a cute Mickey hat, red and green sprinkles, and a dusting of sugar snow for a festive display. 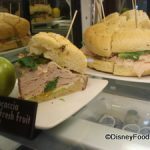 Find this one at Studio Catering Co. and several other counter service locations throughout Hollywood Studios! And just when you didn’t think it could get any better — it SO does! Add a glow cube for some extra pizzazz and a great souvenir. The glow cube version is more expensive (obviously), and can only be found at a pop-up kiosk DURING the Osborne Family Spectacle of Dancing Lights. When you’re ready for a little exercise — and another entry into the challenge — head over to another popular sweet treat destination: Boardwalk Bakery. 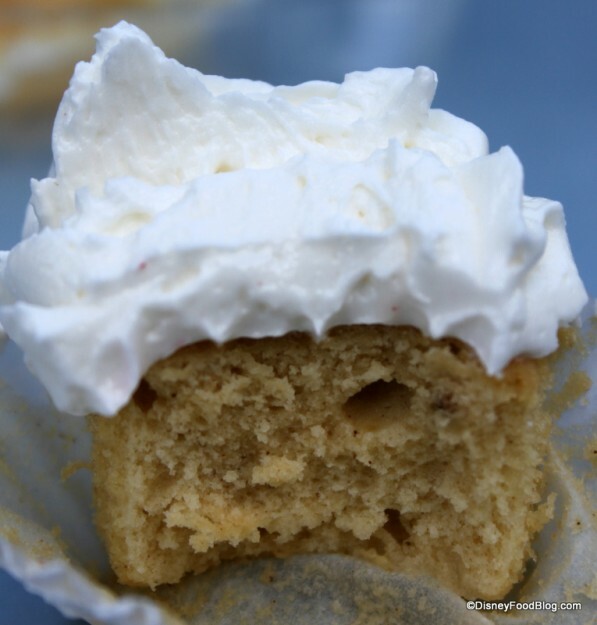 This tiny spot, located along the picturesque promenade of Disney’s Boardwalk Inn, is the home to many of my very favorite cupcakes — like the Peanut Butter Cupcake. 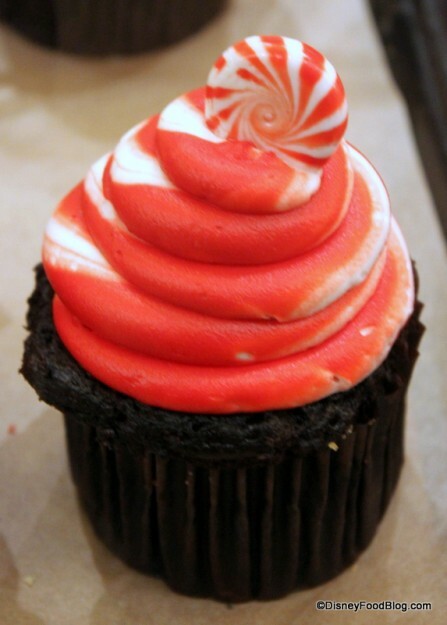 Boardwalk Inn Peppermint Cupcake: Last year’s Peppermint Cupcake featured yellow cake and a completely different look. This year’s option is a new twist, with its peppermint bark garnish and chocolate shavings. 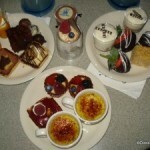 Finally, it’s time to head over to the fourth floor atrium of Disney’s Contemporary Resort to visit Contempo Cafe! This modern and convenient quick service location serves up some of the best cupcakes that we’ve tasted to date, like the spiced apple cupcake. 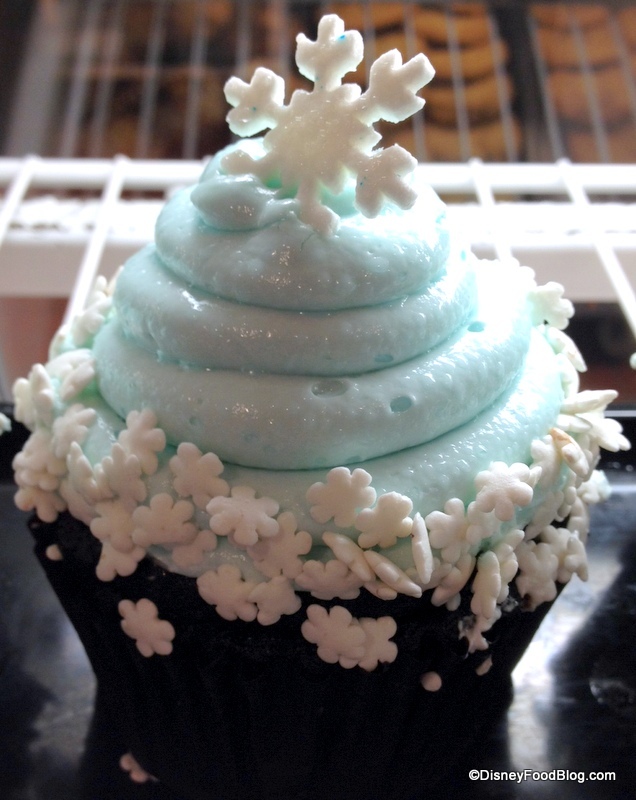 Cool Mint Cupcake: Celebrate the holidays with a classic flavor pairing. Icy mint frosting meets rich, dark chocolate cake for a cool and rich flavor sensation. 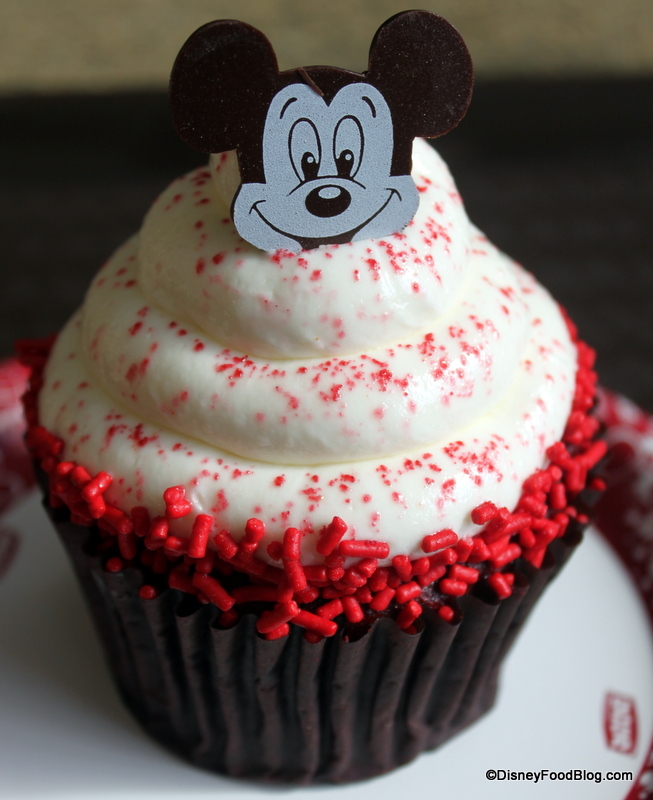 Red Velvet Cupcake: A Disney Food Blog Favorite! 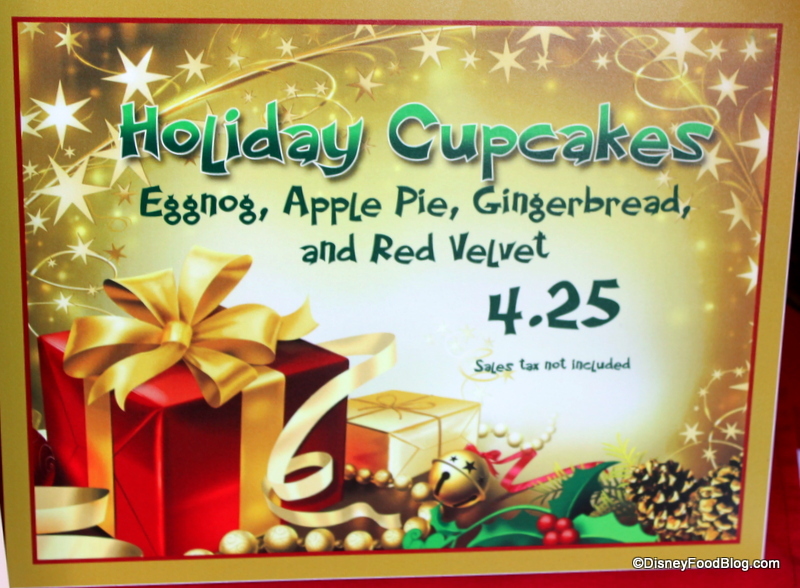 Fortunately, we’re seeing this quite often throughout the year at Contempo Cafe. That makes me incredibly happy, because it’s one of their best! 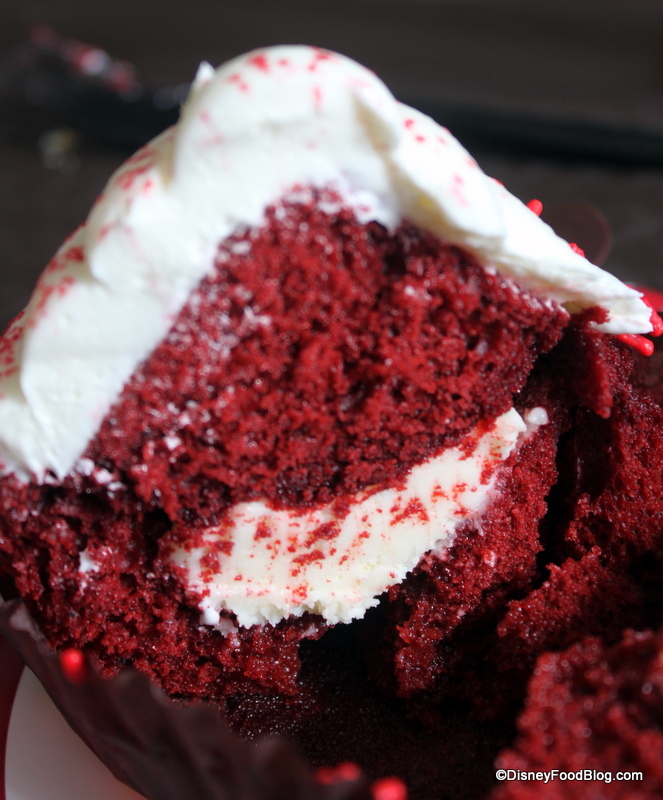 Moist red velvet cake covered with a lighter cream cheese frosting (read more about my thoughts on whether it’s too light in my review.) But the best part is the hidden real cheesecake center! We definitely think this crawl has the makings of an incredibly fun tradition — add in several friends to share the calories and sugar rush, and it’s a party! And you won’t even have to wash dishes! Congrats on attempting our DFB Holiday Cupcake Crawl! Let me know how it went! And for more awesome eats during the Holidays at Walt Disney World, check out our DFB Guide to the Walt Disney World Holidays e-Book — now on sale for $3 off with code Holiday!! 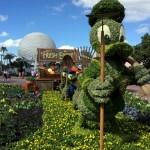 This is a great way to start planning for next year’s Disney Holiday trip adventure! Which holiday cupcake are you most excited to try during the 2012 Holiday Cupcake Crawl? We can’t wait to hear about your favorites! I tried the Gingerbread Cupcake at Hollywood Studio’s – it was so good!!! Highly recommended. We will be in Hollywood Studios on New Year’s Day. 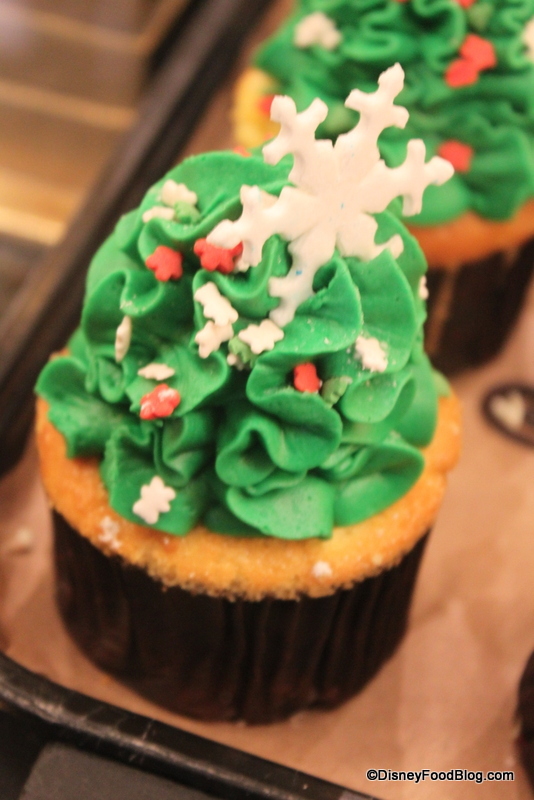 Hopefully the Gingerbread cupcake will stick around for a little bit after Christmas! @V – hilarious about the Colgate!! Erica — I know! That frosting was out of this world! Katie — My fingers are crossed for you for next year! 🙂 Have a great holiday wherever you are, though. V No Privacy — Ha ha! I’m not a huge “cool mint” fan, so I was a bit skeptical as well. tinkymurph — WOO!! I’m sure it will. Have fun and safe travels! AJ, there is also a Pumpkn spice cupcake at contempo that is a pumpkin cake with carmel filling and cinnamon buttercream. The carmel was all drippy and delicious. I loved it!! 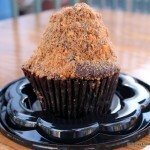 Also, at the boardwalk bakery there was an absolutely incredible pumpkin cupcake. It was a spiced cake with like pumpkin pie filling and a buttercream frosting. If you are going to disneyy for cupcakes, this would be the time of year to do it, however I would try to opt for a cupcake with a unique flavor instead of cool decorations, thats just me…. I don’t ever eat cupcakes due to their overwhelming ratio of icing to cake. I am more of a coffee cake or muffin fan. But, my wife could see your great photos while looking over my shoulder from across the room and immediately started reading this post. She is already making notes for our next trip. I told her that I would agree to do the crawl as long as there is a bar near each stop. ( I’ll make sure we do the MK part of the crawl very early in the morning). Going to WDW over the holidays was already on my bucket list, but this is now added to that item! Definitely drool-worthy, especially for someone who loves all of the holiday flavors. 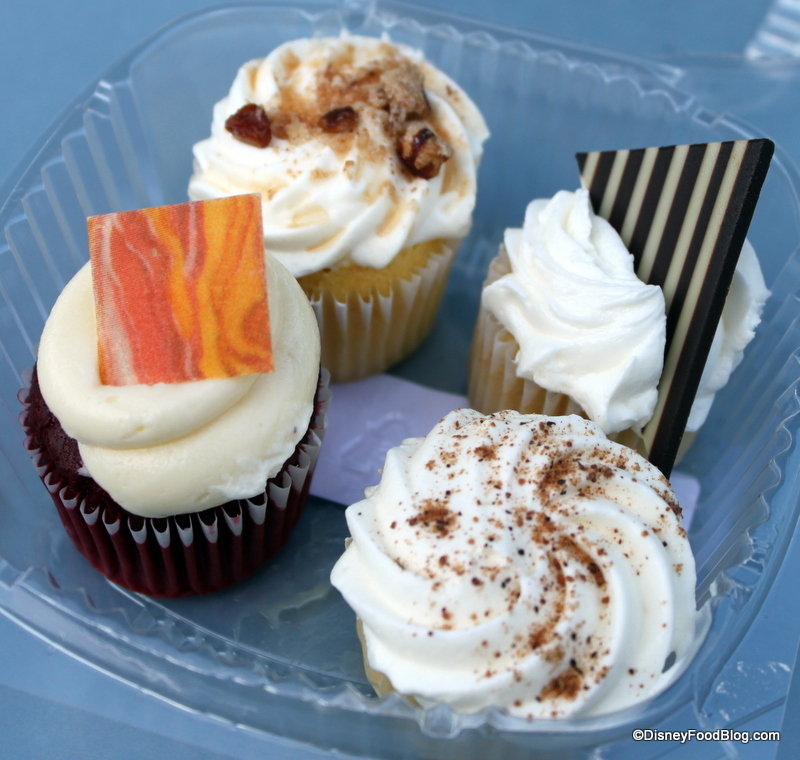 I love that quartet of mini cupcakes…wish I had tried them while I was there in November. 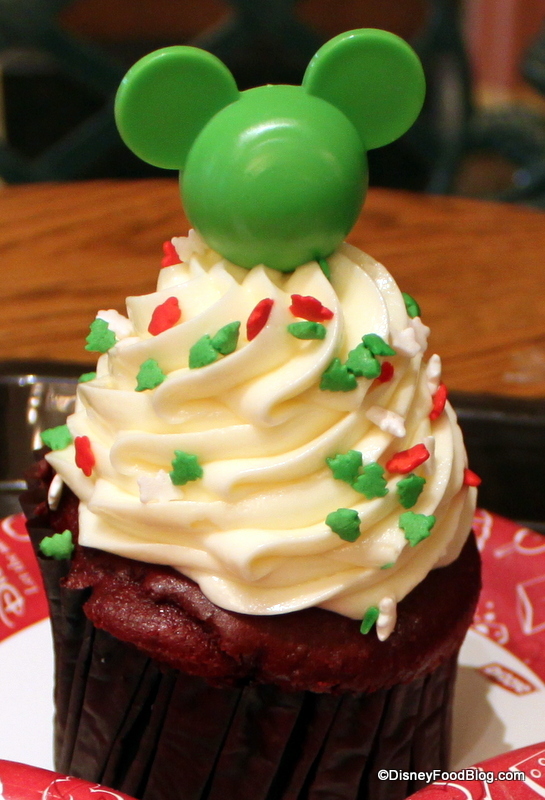 I did try the Main St bakery cupcake with the green Christmas tree icing- the cake was just ok- a little dry. The icing really did not taste very good and I ended up scraping most of it off. It was really cute, though! And the snowflake on top was edible. I saw the cool mint cupcake at the Contemporary and thought it looked really pretty. Has anyone tried it?